The post title is completely stolen from Iowahawk. So Obama releases a picture of him shooting at Camp David, along with the standard leftist B.S. that hunting is a treasured American tradition, which implies that modern weapons are not needed by a citizenry. First, the mocking of Obama is pure gold. 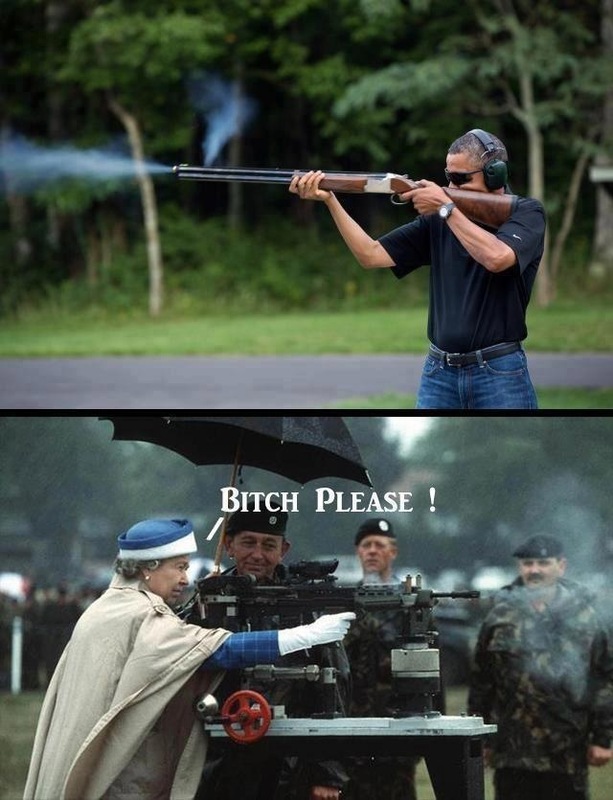 Runner-up, but it does point a point on the fact that an 80 year old women looks more natural with a machine gun than Obama does with a rifle. Here’s the Second Amendment, once again…. As a “constitutional” scholar, Obama should know that the Second Amendment is not about hunting, but rather the God given right that all free men possess, in that they are entitled to the means to unseat those which threaten their life, liberty, or property. Obama is either a liar, or he needs to get his money back for the classes he took on Con Law.